How do you describe your lab to visitors? The Embedded Interaction Lab (EILab) is an applied research lab located in the Department of Design at the Indian Institute of Technology (IIT) Guwahati in Assam, India. The lab envisions and develops solutions that build upon advances in digital technologies, especially technologies that demonstrate the potential to impact the next billion users. It currently focuses on two research directions: technology for societal innovation, aimed at creating an impact among users from resource-constrained settings; and research on novel input-interaction methods, especially targeted toward deformable and flexible devices. The lab has ongoing and previous collaborations with various ministries of the Government of India, IBM Research, Procter & Gamble, Nokia, Microsoft Research, and Samsung Research. A weekly meeting discussing updates and next steps for each team member. What is a unique feature of your lab? EILab has constantly focused on using advanced technologies applied for societal impact in developing regions. The focus has remained on solving core community challenges experienced among users from low socioeconomic and low-literacy backgrounds, which we think makes us unique. To support this initiative, we have begun projects on the theme of Designing for Millions, conceptualizing solutions using contextually suitable yet advanced HCI paradigms of virtual and augmented reality, multimodal interactions, and more. Our success is often measured by how many people we can help rather than by how many papers we publish. As a result, only a small fraction of our work gets published. How many people are in the lab, and what is the mix of backgrounds and roles? The lab currently has 16 people working on different projects—an interesting mix of undergraduate, graduate, and Ph.D. students, plus research associates hired for specific projects. Their backgrounds include computer engineering, electronics engineering, interaction and communication design, and architecture. We also have medical doctors as consultants who support us with domain expertise for healthcare projects. Field workers are chosen from local communities; they help us connect with users, understand the users and their context, and deploy solutions. The interesting mix of people encourages peer learning and collaboration among team members. Briefly describe a day in the life of your lab. A routine day in the lab includes brainstorming and the discussion of new ideas and concepts, as well as quick prototype-building sessions and field trials. A large section of lab members’ time is devoted to the field—conducting contextual inquiries, gathering user feedback, and evaluating the prototypes. The lab also has informal discussions, mentoring, and work updates whenever possible. At a weekly Monday meeting, we go over the work of the previous week and activities for the upcoming one. The lab has a tradition of meeting at least once a day over a cup of tea or coffee. This encourages team building and peer learning. The lab is open 24/7 throughout the year; there are no fixed hours. On the fun side of things, we keep plenty of books and magazines around, both academic and non-academic. We also play chess, carom billiards, Xbox, PlayStation, and guitar. What is one feature of your lab that you could not do without? Our quick prototyping tools. The lab has Arduino and Intel Galileo kits, Makey Makey kits, Legos, a Kinect system, sensors and actuators, an Oculus Rift, an HTC Vive, as well as other head-mounted displays (HMDs), feature phones, and smartphones. These tools help us to build quick and sometimes dirty prototypes, which are extremely important for gathering user feedback at various stages of the design process. What is one feature of your lab you want and do not have? The lab has started to work on developing VR systems for training and skill-set generation, especially in the domain of vocational education and training. This is further extended to training community-service providers for non-academic learning and skill-set generation. Currently the lab has monitor-, multi-projection-, and HMD-based VR platforms; however, we do not have an infrastructure for CAVE-based VR systems. In the coming months, the lab aims to set up a CAVE-based VR platform to tap its potential and explore opportunities in training and educational services. What is the one thing you see as most important about the work you do there? The key aspects of our work are its potential to help developing regions curb challenges, and how we can intervene through innovative yet context-centric solutions, methods, and approaches that solve the most pressing community-based problems. As new digital technologies demonstrate increased potential and opportunities, the question remains: How can we leverage these to elevate underserved communities across all sections and strata of society? We at EILab are approaching this direction to support the most marginalized. For us, it’s the most important aspect of our work. An autistic child using CoinBeam, a design aimed at teaching basic financial transactions. A user using Chetna, a gesture-based information-awareness solution designed for rural pregant women in India. A project aimed at investigating multi-device user interactions in K-12 education. 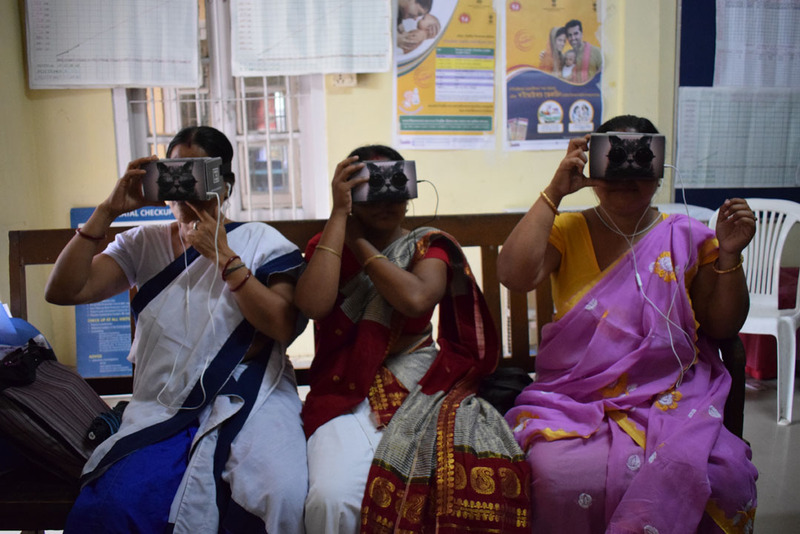 Users exploring Pragati, a virtual reality platform designed to train rural community health workers.